The Graphic Design and New Media (GDNM) Program of BINUS Northumbria School of Design (BNSD) gathered current students, alumni and industry leaders for networking and exchange of ideas in an annual event Port o’Folio taking place every July. The students exhibited their work at BINUS UNIVERSITY FX campus to be noticed by industry leaders such as Design Lab, Y&R, Ogilvy & Mather, Walt Disney Indonesia, and the Indonesian Graphic Design Association/Asosiasi Grafis Desain Indonesia (ADGI). Prominent alumni, such as Andre Manggala, running his own studio, and Jasmine Hanny Surkatty, comic artist, shared their stories of finding passion and making it into a career. 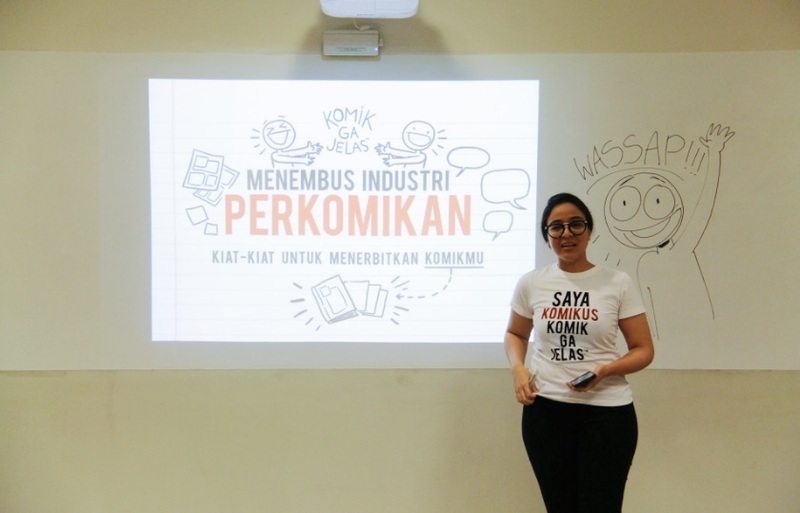 Jasmine Hanny Surkatty, who is also the creator of Komik Ga Jelas (popular comic strip active since 2014 through various social media), has spent some time with the students to reveal tips and tricks of making it in the comic industry. Among other, Jasmine advised students to create a clear brand and network with the professionals in the industry. In Indonesia, for instance, there are several events bringing together stakeholders in the comic industry such Indonesia Comic Con, Popcon Asia, and Comifuro where aspiring artists can meet the publishers and understand industry trends. To stand out from the crowd, she suggests to fuse the author’s idealism and personality into a recognizable brand while making sure to cover contemporary questions through channels reaching the key audience. In short, “A good book will sell itself, but how do we get it sold if it’s unnoticed?” Jasmine said. Events like these connect BINUS students to successful professionals in the industry contributing to 2 in 3 BINUS graduates becoming entrepreneurs or working in global organizations. BINUS currently holds 7th place for employer reputation among Indonesian institutions participating in QS Asia University Rankings 2018.